Welcome to the Vintage Concert Audio e.V. website. This website was officially launched on April 2nd 2019 at the first day of ProLight + Sound / Musik Messe in Frankfurt am Main during our first ever VINTAGE CONCERT AUDIO SHOW. Enjoy and get back soon as we try to update as much as we can continuously. 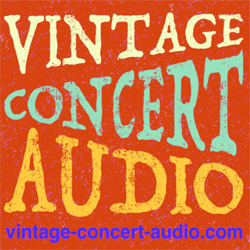 Feel free to contact us with questions or comments you have at info@vintage-concert-audio.com . Thank you.